Alright, here's a little confession: I don't care much for persimmons. But wait! Hear me out. You see, I haven't touched a persimmon for a very long time, mainly because I overdosed on them when I was a kid. Each winter for as long as I can remember when I was growing up, my dad would order a huge (and I mean huge) box of persimmons from a grower that he knew (somehow--how, I never found out!). He would store them inside our brick chimney (we never used the fireplace, so this was a convenient cool and dark location in which to store fruit), and we'd eat persimmons day in and day out for what seemed like months on end. So, as much as I liked the sweet, bright orange fruit, after a few years of this, I eventually couldn't stand persimmons anymore. And so I steered clear away from them since. Until now. Suddenly, one day, I was struck by the overwhelming desire to bake with persimmons. Don't ask me why or where I get these funny notions, but once it got stuck in my brain, I just couldn't let the idea go (damnit, Inception). 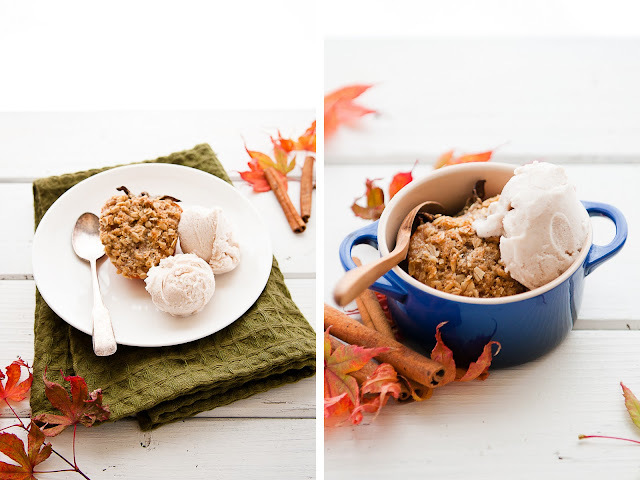 In particular, I knew exactly what I wanted to make: persimmon oat crumbles with coconut cinnamon sorbet. If you're still looking for a Thanksgiving dessert, these crumbles would be a wonderful way to round off the meal. They are super easy to make, and you can make all of the components ahead of time and just pop the persimmons into the oven while you're eating turkey! They're also super easy to serve, since each persimmon half is basically its own self-contained dessert, so no serving utensils are required beyond an ice cream scoop. Lastly, it's nut free and gluten free and the sorbet is vegan (and the crumble can easily be veganized, I'm sure, by using Earth Balance instead of butter)--so a perfect dessert for all! Anyways, I wish you all a happy, happy Thanksgiving filled with delicious food and--more importantly--excellent and engaging company. I still have no idea what I'll be making for Thanksgiving, but I'll definitely be trying to sneak some persimmon, cinnamon, and oats onto the menu! On that note: now taking suggestions and inspiration for my Thanksgiving menu-- What's on your Thanksgiving menu? What dishes (savory and sweet) do you recommend? Tell me in the comments! 1. Combine the coconut milk, water, and crushed cinnamon sticks in a small saucepan with a tight fitting lid. Cook over medium high heat until the coconut milk reaches a bare simmer. Cover tightly and remove from heat. Let steep for at least one hour. 2. Strain the cinnamon sticks from the coconut milk and discard the sticks. Measure the coconut milk mixture. If some liquid has evaporated, add enough water to reach two cups. 3. Return the coconut milk mixture to the saucepan, adding the sugar. Cook over medium high heat until the sugar has completely dissolved. Remove from heat and whisk in the ground cinnamon. 4. Chill the mixture thoroughly in the refrigerator. 5. Once chilled, freeze the sorbet base in your ice cream maker of choice. (Here's mine , which works like a dream, and I also have this one .) Once churned, you may want to let the sorbet harden further overnight in the freezer. 2. Cut the persimmons in half. Set aside. 3. In a bowl, mix to combine the oats, oat flour, brown sugar, salt, and ground cinnamon. Using a pastry cutter or fork, cut the cold butter into the oat and flour mixture until the butter is the size of small peas. 4. Place persimmons cut-face up in a baking dish. 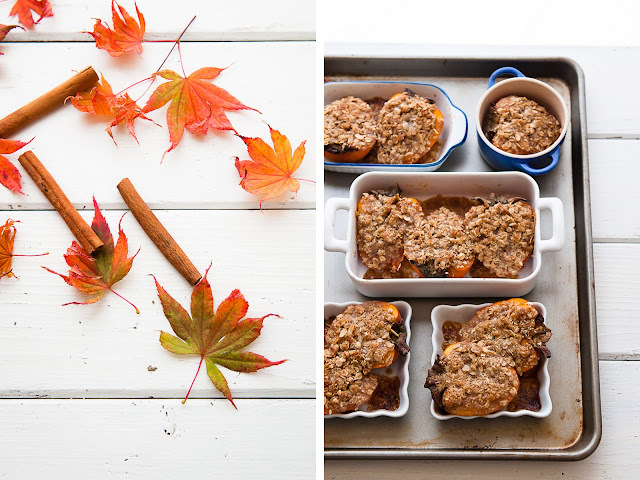 Top each persimmon half with the oat and butter crumble. 5. Bake in the oven for 20-30 minutes until the oats are deep golden brown. Remove and let cool briefly before serving with scoops of coconut cinnamon sorbet. These crumbles look lovely, I might have to hunt out some Persimmon's ... the eating kind that is! I bought a persimmon two days ago. I haven't known what can I do with it. Now because of you I'm smarter ;) Thak you! Oh man, these look fantastic. I wish I had the willpower to bake with persimmons-- they usually end up in my mouth the minute I get back to my apartment! For some reason, persimmons terrify me. It looks great to make a crumble though! Maybe I'll finally try one soon! This looks delicious! I love persimmons; I've always wanted a persimmon tree. I'm going to have to make this when I go home for the holidays. Can I request a persimmon macaron? I don't like persimmons but how could this not be tasty? Your pictures are so fab. You take such great looking pictures! The recipe is also a keeper! I have never cooked anything with persimmons. These are so cute! I only discovered persimmons last year (I usually buy fuyu) but I absolutely love them. I always pair them with cinnamon when I make things with them and actually recently made spiced persimmon baked oatmeal. The coconut sorbet sounds like it really is the perfect finishing touch. steph! i am totally loving the flavor pairing in this and the play with hot & cold is sensational. an awesome dessert idea! Persimmon recipes truly are lacking out there, so thanks a bunch for giving us a great one! Hi! I just tried Persimmons for the first time recently, and am officially in love! This is a must make recipe for me. Love that ingredient shot especially. I've never heard of or thought of using persimmons this way. Very tasty. Looks so good! I love permissions but I never baked with them before.